Revolutionary German Philosopher Karl Marx, born 1818 in Prussia (modern day Germany), was known for publishing the Communist Manifesto in 1848 with Fredrich Engels. His anticapitalistic works would form that basis of the philosophical thought known today as Marxism. His works would soon get Marx exiled out of German and France. Born of Jewish decent, his parents converting to Lutheran in 1816, due to laws banning Jews from high society. Marx’s father was a lawyer and an activist for Prussian reform. Marx attended the University of Bonn and later, after getting in to trouble with authorities for drunkenness, taking part in a duel, and becoming co-president of the drinking society, he would transfer to the University of Berlin under strict order from his father, where he studied law and philosophy. During his term at the university, Marx would become involved with a radical group of students know as the Poets Club who criticized political and religious view and formations of the day. While Marx was pursuing his doctorate, he was becoming more politically passionate. So much so that he put off his marriage with is fiancé, Baroness Jenny von Westphalen who derived from a high-class family. Marx was close and fond of Jenny’s father Ludwig von Westphalen, whom Marx dedicated his doctoral thesis to. 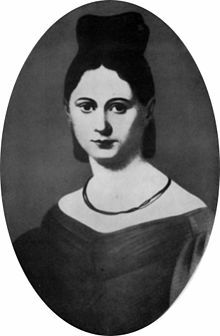 Wife of Karl Marx, Jenny von Westphalen. With his increasing radicalism, Marx was finding a way to combine law and philosophy together. In 1837, Marx joined the Young Hegelians, a group of radical thinkers who followed the ideas of deceased German philosopher Georg Wilhelm Friedrich Hegel, criticizing Prussian political systems, religion, and restricting reason and freedom. Due to his involvement with the Young Hegelians and radical ideas, Marx was banned from pursuing an academic career. He then moved to Cologne where he became a journalist for the radical newspaper, Rhineland News (Rheinische Zeitung), criticizing conservative Europeans governments, political figures and expressing his views on socialism. The Prussian government banned an article written by Marx attacking the Prussian government and the Russian Monarchy. The front page of Rhineland News (Rheinische Zeitung) on the 16th October 1842. Karl Marx wrote and edited for the newspaper. In 1843, Marx and his wife Jenny moved to Paris where Marx became the co-editor of the far-left radical journal, Deutsch-Französische Jahrbücher (German-French Annals), with German Socialist Arnold Ruge. However, his friendship with Ruge along with the newspaper Deutsch-Französische Jahrbücher was short lived due to conflicting views. The newspaper only published a few works before its abandonment. During this period, Marx met German Socialist Friedrich Engels who published “The Condition of the Working Class in England”. Together Engels and Marx shared their socialist ideology publishing “The Holy Family” in 1845. Around this time, Marx began studying the political economy, the relation of production, trade, national income, wealth, law and government. This study would result in Marx’s major published work “Das Kapital” in 1867. Marxism was highly influenced with these studies, English economics, Hegel’s dialectics, and French utopian socialism. A first edition copy of Karl Marx’s ‘Das Kapital’ published in 1867. This book was owned by Marx himself and includes written corrections and annotations inside. Marx was soon banned from France due to writing for yet another radical newspaper, Vorwarts! (Forward! ), which would later become the papers of the Communist League. Unable to move to Germany or to continue living in France, Marx moved to Brussels on the condition that he would no longer publish anything pertaining to current politics. Engels met up with Marx as well as meeting with other exiled socialists such as Moses Hess. Together they shared ideas on the philosophy of socialism and abandoning the philosophy of the Young Hegelians. While in Brussels, Marx wrote The German Ideology which was not published until after his death. Karl Marx and Friedrich Engels with Marx’s daughters Jenny Caroline, Jenny Julia Eleanor, and Jenny Laura in c. 1864. In 1846, Marx founded the Communist Correspondence Committee that inspired socialists across Europe as well as England to hold a conference to form the Communist League. In 1847, the Committee asked Marx and Engels to write and publish the Communist Manifesto, which was officially published in 1848. Marx was then exiled out of Belgium; since he was still banned from living in France and Prussia, he ended up moving to London without citizenship and relied on Engels for financial support. Marx then continued to publish works and pamphlets and work as a journalist. A photograph of a young Friedrich Engels, Marx’s co-author of The Communist Manifesto, in c. 1845. A 43-year-old Karl Marx in 1861. Marx died in London on the 14th March 1883 (age 64) of pleurisy, an inflammation of the mucus membranes. He died as a “stateless” person buried in London’s Highgate cemetery. In 1954, Marx and his family were reburied at a new site. In 1956, The Communist Party of Great Britain erected a tombstone along with a bust of Marx and an inscription from the final line of the Communist Manifesto that reads “Workers of All Lands Unite”. His ideas and works would continue to impact new ideas, thoughts, and eventually lead to large political movements across the world influencing modern day world leaders. The grave of Karl Marx in Highgate Cemetery in London, England where he is buried along with his family. Raised in Seattle, Washington, Theodore graduated from the University of Washington with a major in Communications and a Minor in History. His intrigue for history began in high school while traveling to various countries and being exposed to the cultures and historical monuments. His family grew up in communist Romania which sparked his interest to learn and understand what life was like living in 20th century Europe. While in college, Theodore wrote content for his local news station as well as two radio stations in downtown Seattle.